Wide receiver Devin Hester of the Atlanta Falcons returns a punt for a touchdown against the Tampa Bay Buccaneers during a game at the Georgia Dome on Sept. 18 in Atlanta. Cam Newton of the Carolina Panthers calls an audible against the Atlanta Falcons during their game at Bank of America Stadium on Nov. 16 in Charlotte. Atlanta won 19-17. With just one week remaining in the NFL regular season, the playoff implications are fairly straightforward, and running thousands of simulations of Week 17 outcomes may seem like computational overkill. 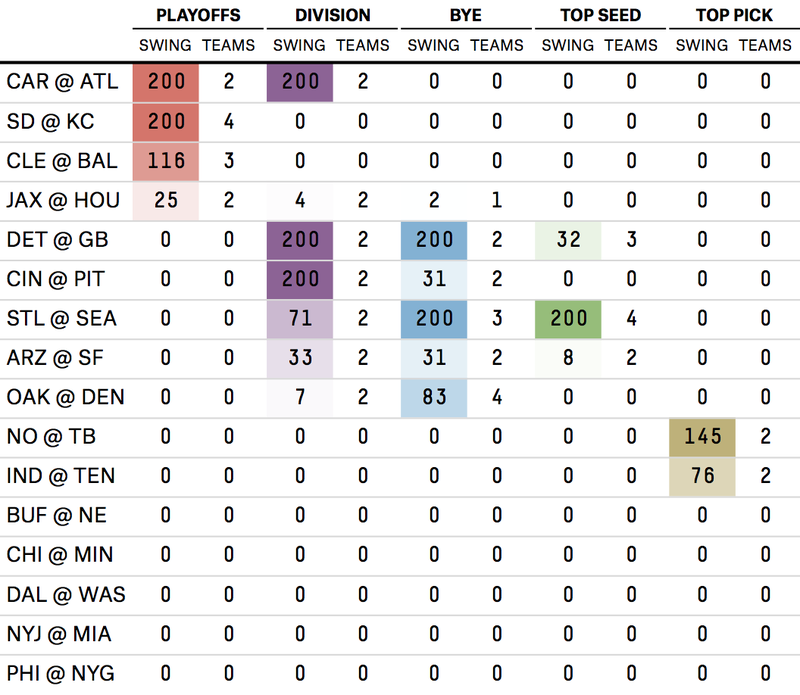 But the playoff field is far from settled, particularly the seeding, so a simulation model can still be helpful in sorting out the probable from the improbable. The winner will most likely face the Arizona Cardinals in the first round of the playoffs, though there is still a 7 percent chance the NFC South winner will face the Seattle Seahawks instead. There are four NFC teams with any real chance at the conference’s top seed.1 The Seahawks can clinch the top seed with a win over the St. Louis Rams. A Seahawks loss would boost the chances of securing home-field advantage throughout the playoffs for the Detroit Lions, Green Bay Packers and the Cardinals. If you find the various clinching and elimination scenarios for your team too difficult to keep track of, we’ve made it easy on you. Use the interactive tool below for a quick summary of which games matter — including those that matter for the top draft pick.2 The race for the first overall pick in the 2015 NFL Draft is between the Tampa Bay Buccaneers and the Tennessee Titans. 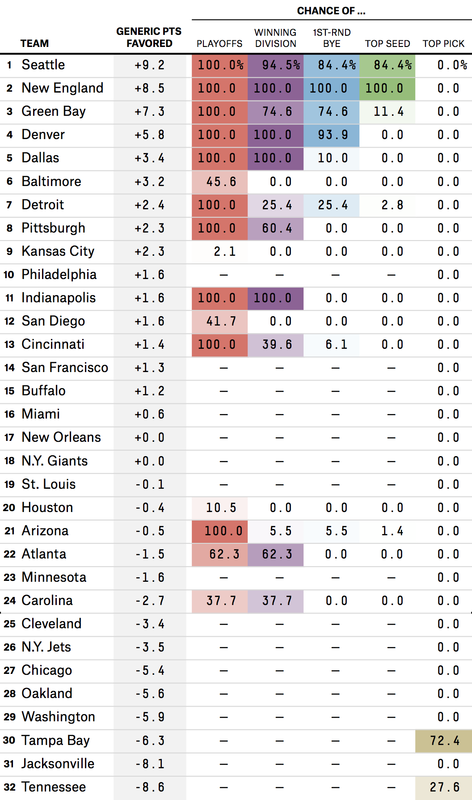 The Buccaneers are the current favorite, owing to a weaker projected strength of schedule than the Titans. The playoff situation is slightly more open in the AFC. The New England Patriots have clinched the top seed. And the Indianapolis Colts are locked into the fourth seed, where they will face either the Pittsburgh Steelers or the Cincinnati Bengals in the first round. A matchup with the Bengals looks slightly more likely at this point, with a probability of 60 percent. The San Diego Chargers’ playoff fortunes have swung wildly. Their probability of making the playoffs was as high as 76 percent in mid-October, but dropped to near single digits just a month later following some key conference losses. Going into Saturday night’s game against the San Francisco 49ers, the Chargers’ playoff chances were just 15 percent. In that game, San Diego overcame a 14-point deficit in the fourth quarter to force overtime before winning on a Nick Novak field goal. Technically there are five, but the Dallas Cowboys would need a tie between Detroit and Green Bay for a chance at the top seed — something that’s very unlikely. The interactive does not include the 16 teams that have nothing to play for this week, which is all the teams already eliminated from the playoffs that don’t have a shot at the No. 1 pick, plus teams like New England and Indianapolis whose playoff position is set.